This was a really crazy month for us, both in general and financially! Kyle defended, I had an (unsuccessful) out-of-town job interview, and we had both of our families come into town. Plus, we received an inheritance that pushed our net worth above $100,000! (I don’t include gifts in our income so the inheritance is not reflected below.) So a lot of upheaval overall, but thankfully our budget ran fairly smoothly. We had an unusually high month for spending out of our targeted savings account and an unusually low month for transfers into those accounts. The difference was over $1,000! This is a month that would have wrecked our finances back before we started our targeted savings accounts. We knew in advance that our car and rental insurance would be paid, but I had to outfit myself for an interview I found out about at the last minute. I also fit in an optometry appointment that needed to happen before I lose my insurance, which was rather expensive. RETIREMENT SAVINGS: Our new slightly increased rate, 18%-ish. Cell phones: Kyle’s usual $69.77. This month I paid $2.94 for my phone because of account credits from people using my referral link to sign up for Republic Wireless. It looks like I’m out of referral credits again. 😉 If me telling you again how much I love Republic Wireless will encourage you to sign up, let me know! Groceries: We were about 10% over budget here, which I’m okay with. We spent a bunch of money on groceries for the brunch we threw after Kyle’s defense. 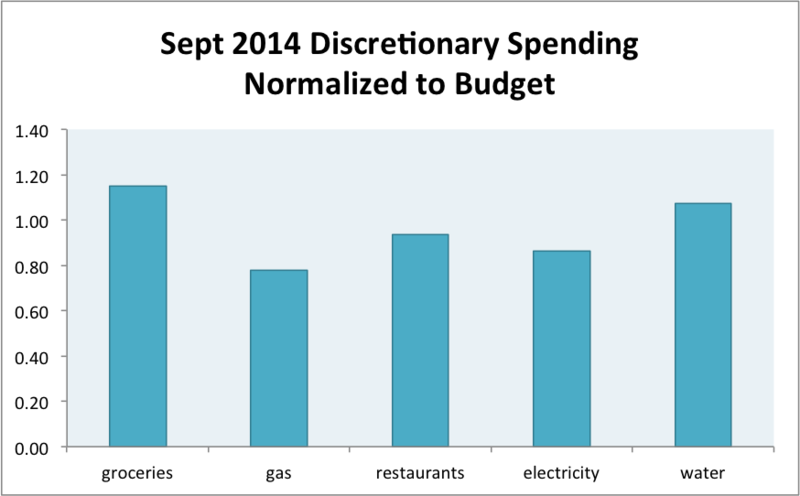 Other than that spending was fairly normal. I think Kyle might spend more money when he grocery shops than I do and he’s taking over the shopping now that his defense is done, so we will see how that shakes out. 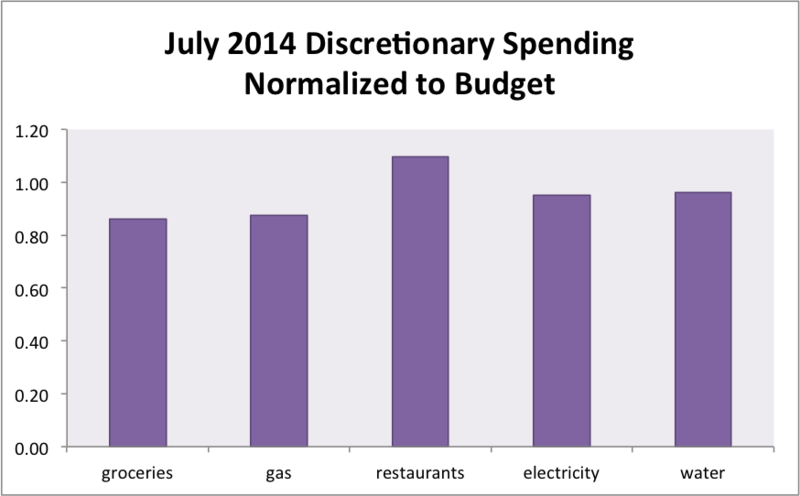 We might be in for a high-spending summer as grocery spending is generally high anyway during that season. Gas: We actually had 3.5 fill-ups this month, way more than our normal 2. I think it was because I had to do a bunch of shopping in advance of my interview so I drove a lot more than normal. Plus when our family was in town we were driving around doing things when we normally would have been parked at work. I hope we’ll see this go back to normal next month. Restaurants: Way over here because of having people in town and convenience spending in advance of Kyle’s defense – but a reasonable overage, I think. 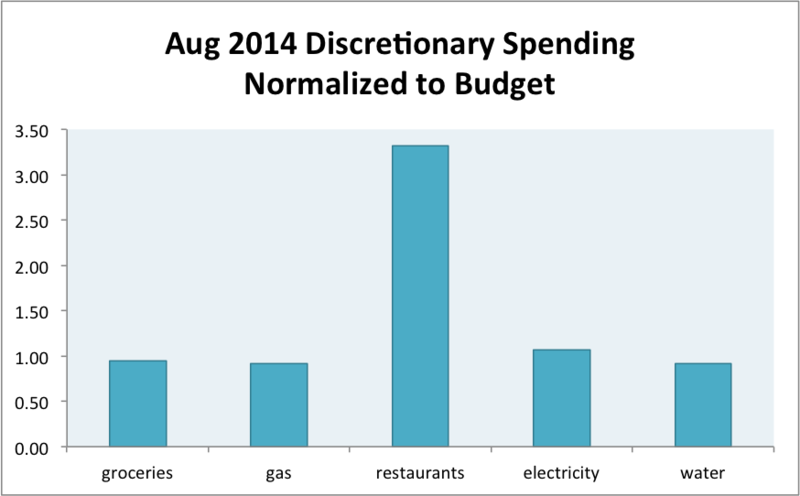 Electricity and Gas: Yay, finally an under-budget category! We’re still in the nice spring season here so no need for much A/C. Water: Just a hair over budget here. I spent $21.74 on a defense gift for Kyle. I spent $85.84 on travel expenses for my interview in Atlanta. I have submitted the reimbursement so I’m just waiting on that to come in. I got a $20 referral bonus on my Capital One 360 account. I’ve had a referral link to it up for at least a year now and this is the first one I’ve gotten – so thanks, whoever! I hope you’re enjoying the account! We spent $1 on airport parking when Kyle picked me up from my flight. I left a $5 tip in my hotel room. We spent $1038.77 out of these accounts and transferred $32 in above our normal savings rates. We transferred out $471 to pay for six months of auto insurance and part of a year of rental insurance. I spent $197.46 on a new suit and blouse for my interview. It’s too feminine for Kyle’s tastes, which is weird because I think he wished my normal dress code were more feminine. I spent $55 on a (bad!) haircut and Kyle spent $20 on a haircut. We spent $12.63 on dry cleaning. Kyle spent $58.03 on a remote for his computer with a laser and timer and such. He used it in his defense and we hope many more presentations in the future. I paid $224.65 for an eye exam and new lenses for my glasses. I should receive a $100 voucher from my insurance company after they process my claim. This was my first eye exam in FIVE YEARS, y’all! I wanted to get it in before I lose my current health insurance because I don’t fully know what my benefits will be under Kyle’s plan. Thankfully, my prescription only changed ever so slightly. We reimbursed $32 to this account for four weeks of CSA produce. No budget adjustments. Second-to-last normal month before Kyle’s raise kicks in/I lose my income! We had a surplus of $13.75 this month (against all odds!). I transferred it to our general savings account to reimburse us for our move last fall. 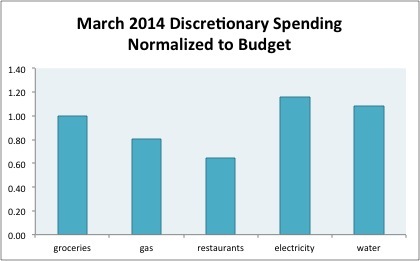 What happened for you in your most recent financially crazy month? Is your budget changing for the summer at all? 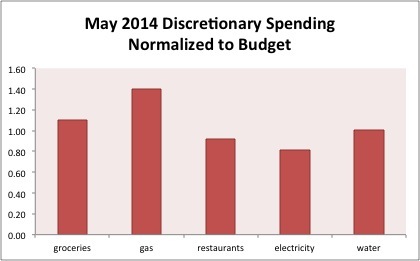 7 Responses to "May 2014 Month in Review: Money"
Thanks for using my link! It was a nice surprise. I do prefer Ally but CapitalOne 360 is a good account, too. I’m glad not too much changed when they took over ING. Good for you for experimenting both to see which will work better for you.